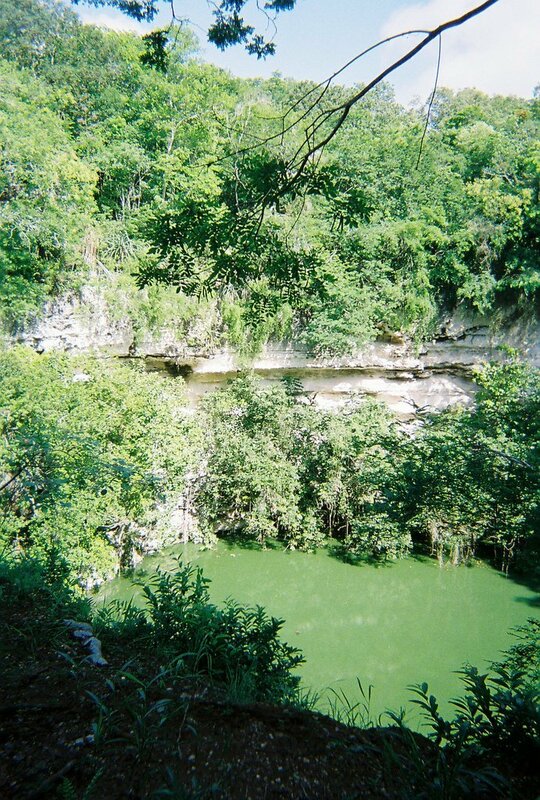 - dozens and dozens of cenotes (prounouced "say-NO-tays"). Cenotes are sinkholes filled with water and often connected to underground rivers. 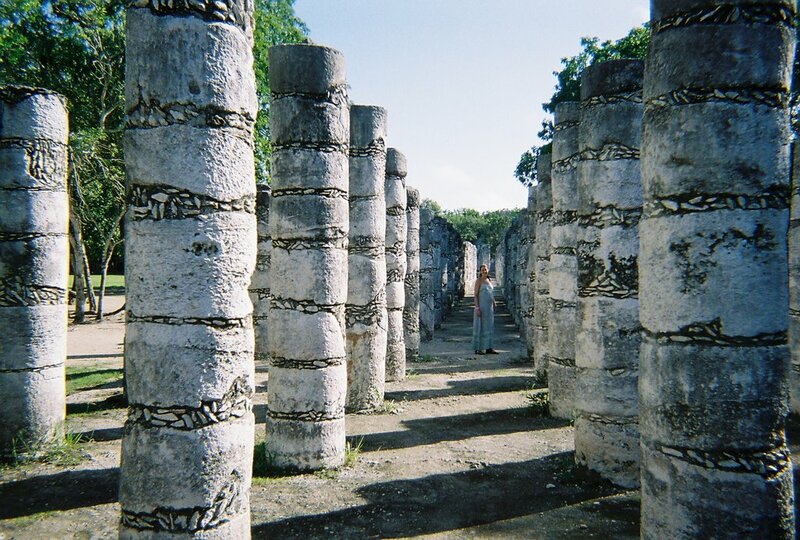 These geological features result from the region's limestone composition, and they were considered sacred portals to the gods by the ancient Mayans. 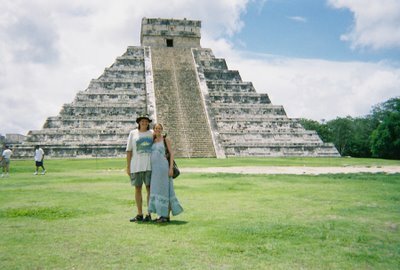 Considered among the most fabulous of the archeological sites in the Mayan world, Chichén Itzá did not disappoint. 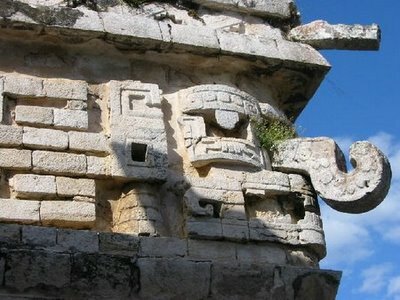 Dating from the late-classic and early-post-classic periods (approximately 600-1200AD), the site features both exceptional structures and carvings. Located only 2 hours west of Cancún, it is one of the most visited Mayan ruins sites. This structure was one of the only observatories built in the Mayan empire. Named "The Plaza of 1000 Columns" by archeologists, this area was probably a ceremonial center. 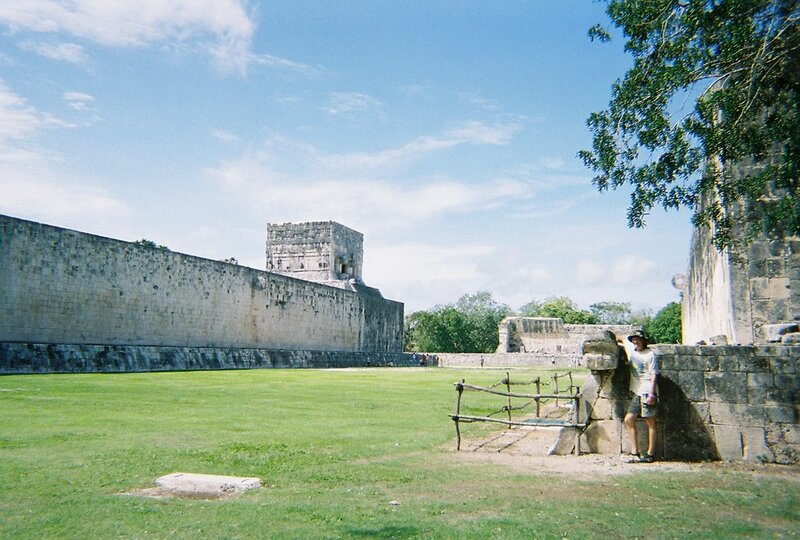 This gigantic ball court is the biggest one of its kind known in the ancient Mayan empire. As archeologists have determined from ancient drawings, the idea of the game was to get a large rubber ball through the stone hoop high up on the right-hand wall (over top of Rob and the snake head that he's hugging), without the players touching the ball with their hands or feet. 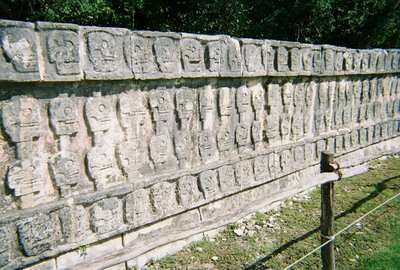 (elbows and knees were ok) In typical Mayan goriness, the players on the losing team were usually sacrificed to the gods. An eagle plucks out the heart of a dead man and prepares to eat it. 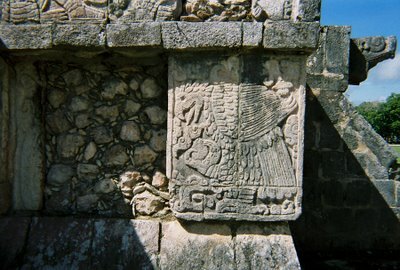 (The eagle supposedy represents an Itzá warrior) On the right a serpent head, missing its lower jaw, is jutting out from the structure. This carving represents one of the Gods, known by archeologists as the "big-nosed God", or something like that. This cenote, located about half a mile from the Great Pyramid at Chichén Itzá, was supposedly considered one of the most sacred in the ancient Mayan culture. When archeologists dredged it during the 1960s, they found hundreds of skeletons from human sacrifices, as well as thousands of artifacts made of gold, jade, conch and other sculpted materials which were thrown into the water as offerings to the gods. 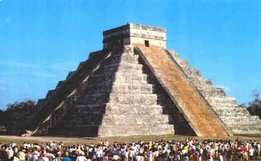 One of the most fascinating phenomenom at Chichén Itzá occurs on the Equinox (March 21 and September 21) when the reflection and shadows of the sunlight create the illusion of a giant illuminated serpent crawling down the shaded left side of the Great Pyramid. 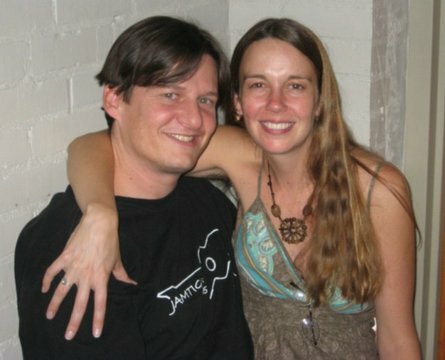 (You can see this in the above photo, which, needless to say, we did not take.) 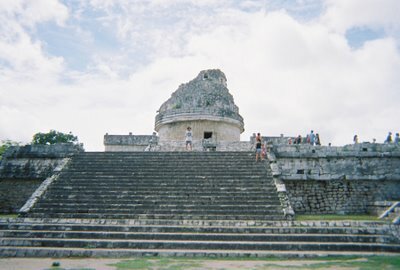 Coincidentally, there is a giant stone serpent head carved at the bottom of the pyramid, which is also illuminated. 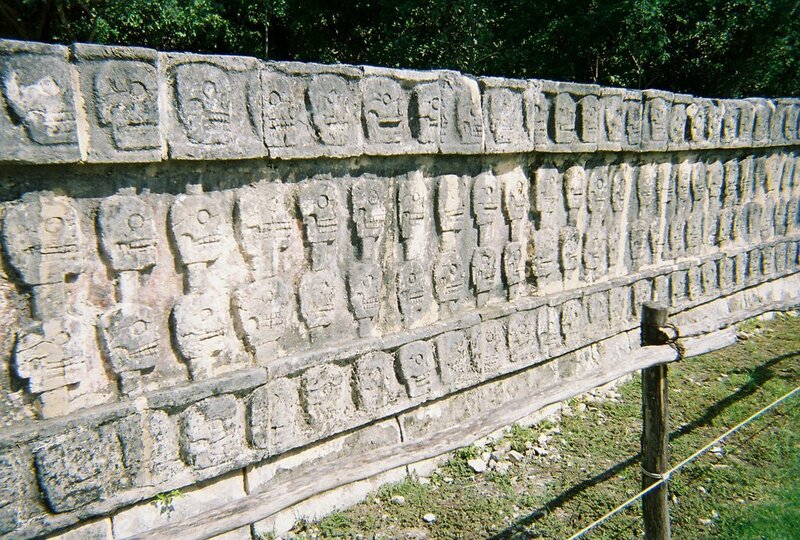 Because of this illuminated snake phenomenom, Chichén Itzá gets extremely crowded during the spring and fall equinox. 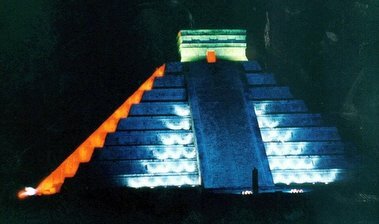 Each night Chichén Itzá they put on a light show production where they reflect light on the Great Pyramid in sort of a re-enactment of the Equinox phenomenom. Again you can see the illuminated image of the serpent crawling down the left side of the pyramid, ending in the carved serpent head at the bottom.